Cool Hand Burg: No Flash! If Karen was independently wealthy, she'd get a job working at an art museum. Her entire job would consist of yelling at people for taking flash photographs and touching the artwork. 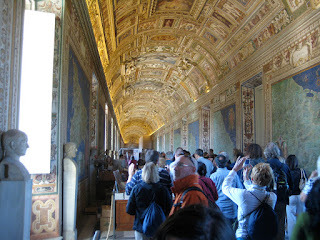 Erik used to think she was a little crazy, but about halfway through the Vatican Museum he found himself saying "Scusi! No flash!" and wagging his finger at a scared tourist. I'm not kidding, he seriously wagged his finger. Karen was never more proud to be his wife.